Sign up for our VIP member list for coupons, give aways and specials. Welcome to Clarey Clayworks! 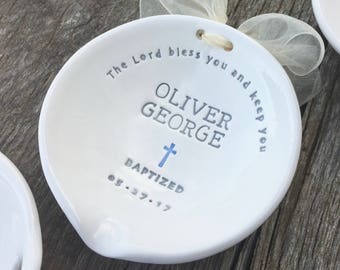 We're passionate about making faith-filled gifts for Baptisms, First Communions, Godparents, Weddings, Christmas and other Christian holidays and milestones. Make sure to follow us on Facebook and Pinterest to see the latest designs and current specials. Working on new variations for one of our favorites! Our newest model with our latest color option! 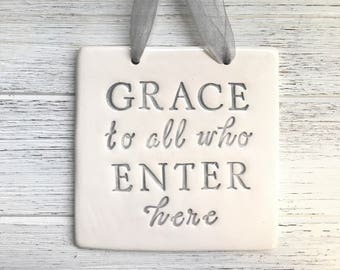 gifts for the faith-filled home. We are an independent ceramic art studio located in the Arts and Design District in old town Carmel, Indiana. If you are nearby, please stop by and say hi. If you are not, you can keep up with us on social media - see links below. When not at home with her husband and 3 boys, Stephanie is responsible for packing and shipping all of our orders. She takes great pride in making sure your piece arrives not only safely, but beautifully packaged! A native of Indiana, Shawnteé recently earned her B.F.A in ceramics. Along with her passion for clay & glaze formation, her technical skills keep the day to day operations of our studio running smoothly! Sheryl is our newest staff member & assists in both production and shipping. Sheryl is a wife and mother of three. She enjoys volunteering at her church, her children's schools and in her community. Thanks for stopping by Clarey Clayworks. We are happy to have you here! 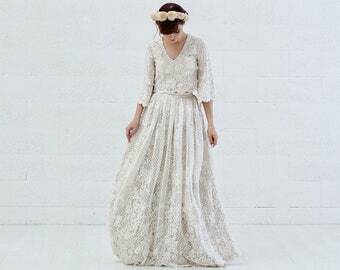 Please list ALL necessary information regarding your piece including personalization, and event/date in the “message to seller” section at checkout. Unless otherwise noted in individual item descriptions, usual turn-around time for custom pieces is 7-10 days plus shipping. Please plan accordingly. If you are in doubt whether your piece will arrive in time, please contact me to discuss. 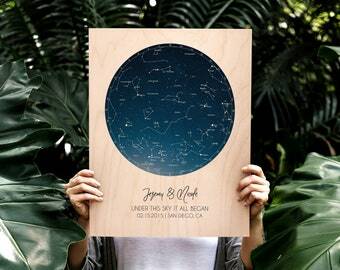 Items listed that are marked “ in stock” or “ready to ship” will be sent out within 3 business days (or sooner if agreed upon) of receipt of payment. Once your order is placed, you will receive an email receipt through Etsy confirming the sale. You will receive a second email from me notifying you of when your item has shipped. If Priority Mail is used, you will receive a tracking number. Clarey Clayworks hand forms each and every piece, one at a time, ensuring that no two items are the same. Subtle variations in shapes and differences in glazes are desirable as they add to the unique character of each work. Most of our pieces contain lettering that is individually hand-stamped. A certain 'unevenness' in spacing of characters is to be expected and adds to the one-of-a-kind charm of the piece. All ceramics are fired twice as only this time honored step of glazing can guarantee your piece will be properly sealed and waterproof. 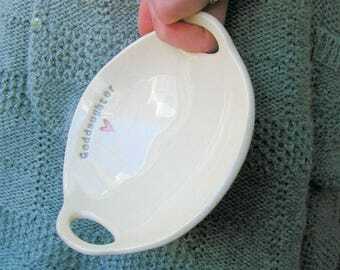 It also ensures your heirloom will resist yellowing or fading for the many generations it was crafted to be used. Photos shown for listed items may be representative of the design and not the specific listed piece. Every effort is made to give an accurate description of each item. We take great pride in crafting your item and make every effort to get it to you in one piece! Each item is packed securely and with utmost care. If your item arrives damaged as a result of shipping, please e-mail a photo of the item within 2 days of receipt. We can begin the claims process and arrange for replacement. NO refunds will be made for custom orders unless error is on the part of the seller. Please send a photo within 10 business days of confirmed delivery notifying us of the specific error to receive a replacement. PLEASE check your order for proper dates and name spellings PRIOR to submitting. We cannot guarantee any changes once your order is received and work has begun. If you need to cancel an order, please contact us immediately. If work has begun on your piece(s) no refunds will be made. 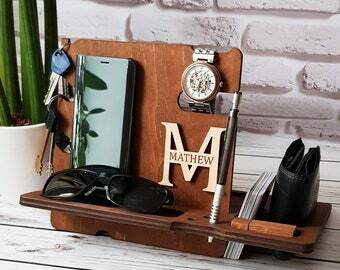 We want you to love your keepsake as much as we enjoyed crafting it. If you are not happy with your order, please contact me directly at anne[at]clareyclayworks.com before leaving feedback. I want every opportunity to correct any problems - our goal is to create a piece you will ultimately cherish. Clarey Clayworks accepts all major credit cards, PayPal and Etsy gift cards. 7% sales tax will be added to all transactions for Indiana residents. Clarey Clayworks preferred method of shipping is by US Postal Service. Either First Class or Priority Mail are available. We have found this method to be the most timely and cost effective to our customers. We do offer Priority Mail Express should you need a guaranteed delivery service. Priority Mail Express is guaranteed 1-2 day delivery or your shipping fee will be refunded by USPS. If you live in the Indianapolis area and would like to pick up your order please send us a convo to arrange and we will refund any shipping fees. **We ship internationally – if your country is not listed please contact us for rates! International buyers will be responsible for ALL customs and duties. If you are unsure of what, if any, duties will be due, a simple Google search will usually find accurate rates. Again, you are responsible for paying all taxes imposed by your country. All purchases from Clarey Clayworks arrive in our Signature Gift Box complete with ribbon. 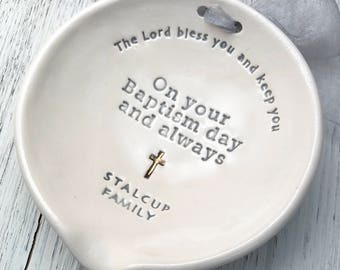 Our ready-to-ship Baptism Bowl™ and Custom Baptism Bowl™ come with a card outlining the special purpose of this unique piece and how it is to be incorporated in the Baptismal ceremony. If you are sending your purchase as a gift, please notify us in the “message to seller” box upon checkout. We would be delighted to include a gift card and message to the recipient. **If your package is delayed -- Clarey Clayworks agrees to ship all items on or before the "scheduled to ship by" date listed in your order confirmation (e-mailed at the time of purchase) or sooner if prior arrangements have been made. Though rare, delays can occur. If your order has been shipped in the agreed time frame (see above) any delays are the sole responsibility of the carrier and no compensation will be made by Clarey Clayworks. 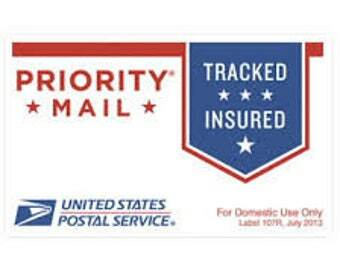 USPS Priority Mail includes shipping insurance (up to $100) and is claimable ONLY if an item is LOST or DAMAGED -- not delayed. PLEASE plan accordingly and allow enough time when ordering. Once the packaged has been shipped from our shop, it is in the care of the carrier. As we strive to make sure that shipping information is correct, we cannot control what happens once the has left us and is en route. Sometimes the carrier will try to place the package in a inconspicuous location, or with a neighbor. Once your tracking number has been received (the tracking number is emailed once your order has been shipped) begin checking the appropriate carrier website to see the shipping status. If the status of the package states that it has been delivered and you still have not received it, consult the carriers website for instructions. IF your order is lost by the carrier, insurance by USPS (up to $100) is included in the Priority Mail shipping fee. Please contact us and we can assist you with the claims process. All designs, descriptions, content and photos are the creative work and sole property of Clarey Clayworks and do not transfer with purchases. Please know we defend our years of work and education. We vigorously pursue and take action against ALL copyright offenders. At Clarey Clayworks, we are blessed to have a business in a field we love and enjoy. We thank God for the opportunity to serve Him and spread His word through our unique work. A portion of our profit goes directly to local Christian charities. If you would like a list of these charities, or would like to share the name of one of your favorites that we could donate to in the future, please leave us a note in the “message to seller” section. (¸.•´ (¸.•` thanks for looking! 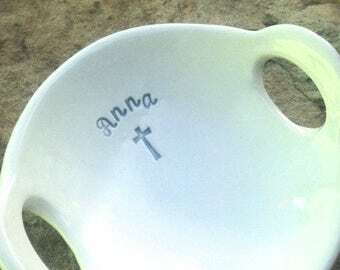 Can my Baptism Bowl™ be used in the actual ceremony? Yes! 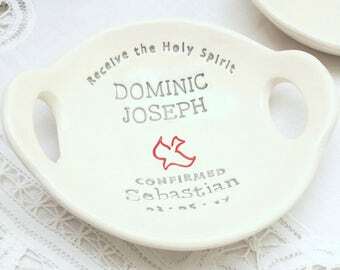 Your Baptism Bowl™ is specially designed to pour the baptismal waters during the ceremony. Holy water can be housed in any clean container or vessel. We have received wonderful feedback and numerous compliments from Catholic priests, deacons and other multi-denominational ministers who have used our bowls. We do recommend, as a courtesy, that you give the priest or minister notice prior to the ceremony so that he or she may properly prepare.